Often described by scientists as a complete food, Bee Pollen is one of nature’s most nourishing foods. It is produced by honeybees from flower pollen mixed with nectar and it has been widely used throughout history all around the world for its antioxidant, nutritional, and health-sustaining properties. It delivers a complex range of nutrients in its most natural form, making it the perfect addition to our energy blend. Natural Energy uses the proven health boosting components found in Bee Pollen, further enhancing it with a unique synergistic enzyme blend to help release the Bee Pollen’s energy-boosting properties. These added enzymes such as Lipase and Amylase help to support gut health and digestion, assisting your body in getting the nutrients you need from the supplements and foods that you eat. Native cultures worldwide have used Bee Pollen as part of their daily nutrition, as well as a survival food due to the amount of vitamins, amino acids, trace minerals and enzymes found in its small quantities. The Maori, the indigenous people of New Zealand, pounded bee pollen into cakes that were dried and packed to keep them fueled on long journeys and to supplement their diet. Natural Energy can be taken on an empty stomach so it is perfect for taking mid-afternoon, when you need a get-up-and-go boost from nature. Taking it at this time might also help you avoid mid-afternoon cravings for junk food and sugar. Bee Pollen is also held in high regard and used as a natural remedy for allergies and hay fever support. The theory is that by regularly ingesting small quantities of pollen you familiarize your body with the particles you are sensitive to, building up your body’s own immunity. We would advise trying this natural approach to seasonal allergies with the support of your health practitioner. Bee Pollen from New Zealand has long been valued for its pure and clean properties. It is free from air pollution and other contaminants found in so many other commercial brands. You deserve the best Bee Pollen available and we’re proud to give you exactly that with Natural Energy. Although we have listed the ingredient enzymes that we use to blend with the Bee Pollen Powder, it is the blending methodology that we have developed that makes the combination so effective. Normally enzymes have to be enteric coated to be effective, but in this product they do their 'work' before the Bee Pollen is even encapsulated. We put this product in a capsule as we want the 'mix' to be released in the stomach. Other Ingredients: Capsule (Hydroxypropylmethyl Cellulose, Water), Magnesium Stearate, Silicon Dioxide, Tapioca Starch, Maltodextrin, Ascorbic Acid (Preservative), Malic Acid (Preservative), Potassium Sorbate (Preservative), Benzoic Acid (Preservative). Daily serving: Men or women – 3 capsules. For optimal results take 3 capsules during the afternoon, preferably on an empty stomach. Combines well with Total Balance and our Omega 3 Fish Oil products. 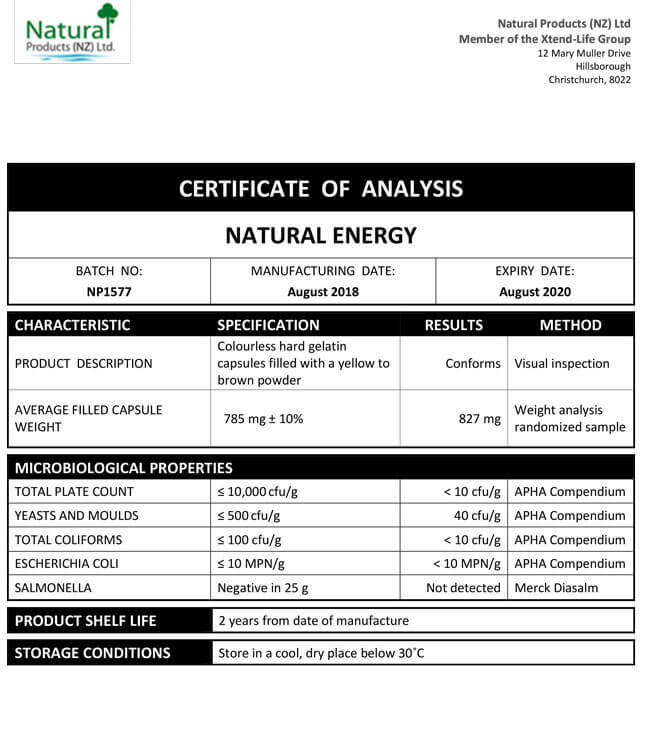 We have included below a copy of a typical Certificate of Analysis (CoA) for our Natural Energy product. You will note that there are two columns which are headed 'Specification' and 'Results' respectively. The specifications are simply our minimum standard to which each batch of Xtend-Life Natural Energy has to conform, otherwise we would not release it. The results are the actual results from the independent laboratory that did the testing. How does bee pollen help to increase energy and improve other bodily functions? The known nutrient breakdown of bee pollen is approximately 35% protein, 55% carbohydrates, 2% fatty acids and 3% minerals and vitamins, including B-complex vitamins, vitamins A, C, D, and E, plus beta carotene, selenium, and lecithin. There are still many as yet undiscovered components in bee pollen. As these are identified scientists may be able to explain more fully why bee pollen is so beneficial for us. Studies into the components of bee pollen continue. Research has demonstrated that people who consume bee pollen report enhanced vitality, energy and endurance, and it may also help to help expel toxins. Some people find that it can be useful regulating their appetite, boosting the metabolism and managing food cravings as well. Can I split the Natural Energy capsule open and add the powder to foods? They are best swallowed whole, but if you can't do this for any reason they can be split open. You certainly may empty the contents of the capsule and add to cold foods or drinks, please ensure to avoid hot items as this may damage some of the valuable ingredients. Bee pollen alone has quite a pleasant taste and may be a common addition to smoothies or juices. Natural Energy may be used in the same way, although please bear in mind that along with bee pollen, this product includes many other ingredients, so the taste will vary from pure bee pollen. Also, please aim to consume the contents of the capsule as soon as possible to avoid degradation and oxidation of the valuable properties. Is Natural Energy heated when it is encapsulated? Natural Energy is not heated during the encapsulation process. Therefore the valuable properties are not damaged as they may be in methods used by other brands that apply heat during manufacturing. What other conditions can bee pollen help with? Bee Pollen contains many nutrients and may be helpful for athletic endurance, stress, immune system improvement, allergy-resistance, sexual health and general energy as part of an appropriate diet and supplement program. Please ask us for more individualized advice. Can Natural Energy aid weight management? Natural Energy may prove a useful aid to weight management as the pure bee pollen it contains has a stimulating effect on metabolic processes, supporting fat metabolism and expenditure. Other nutrients included, such as manganese, may also assist in reducing cravings for unhealthy foods. Of course, it is best used in conjunction with a healthy diet and lifestyle and is not a quick-fix, cure-all for weight concerns. As it is a naturally based product also, it will work differently for every person. Can I take Natural Energy if I have an allergy to pollen? Bee pollen has actually been shown to help, rather than exacerbate various allergic reactions, even where pollen allergies themselves are concerned. This is due to a type of 'de-sensitization' process if bee pollen is taken in small doses by a susceptible person. Our formula may provide an advantage because it is from a pure source, powdered by non-chemical processes, and it includes enzymes that assist with the absorption, ingestion, and assimilation process, as well as enhancing the properties of the pure pollen itself. Although we would advise caution for anyone known to have a pollen allergy, it may be possible for you to take this formula, beginning with small doses and with careful monitoring. Please check with your doctor first. Can people who are allergic to bees and bee stings take bee pollen and other bee products? The allergy is to the venom, not to the bee or its pollen, so most people will be fine. Approximately 0.1% of the population will have a problem taking bee products, but the vast majority won't. However, as with any new supplement, especially if you are known to have sensitivities, begin taking it gradually, and make sure that you are not seeing any negative reactions. If your reactions are known to be potentially severe it is advisable to consult with your physician. What is the recommended dosage for Natural Energy? Can I take Natural Energy during pregnancy? We suggest that you first seek the approval of your physician or midwife before taking Natural Energy during pregnancy. There is a slight caution with the Bee Pollen in the product, as the baby may not be immune to sensitivities such as pollen (shellfish is another). Your physician may wish to investigate your medical history (parents, partner etc) to determine if there is any potential for an allergy. One of our products which is highly recommended during pregnancy is our Omega 3/DHA Fish Oil. It is known to help support the brain development of the baby as well as giving sufficient DHA to the mother. Where is the bee pollen in Natural Energy sourced from? The bee pollen in Natural Energy is sourced from a pristine, pollution-free region of Canterbury in New Zealand's South Island. It is far from any cities or industry and thus is exceptionally pure and free of contaminants.